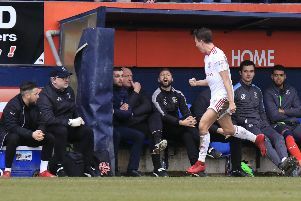 Luton boss Nathan Jones hailed another ‘excellent day’ as his side moved to within a whisker of promotion out of League Two by beating Crewe Alexandra 3-1 at Kenilworth Road this afternoon. Town had fallen behind for the second home game running, Jordan Bowery opening the scoring on 34 minutes, only for Town to hit back and lead 2-1 at the break, through Danny Hylton’s 22nd of the season and Elliot Lee’s sublime strike. Pelly-Ruddock Mpanzu’s exocet sealed the victory in the second period, with Luton now just one win away from playing League One football next term, as Jones said: “It was an excellent day. Apart from a late spell where they just pumped it in our box, which is not quite the Crewe way, but needs must I understand, I thought it was wonderful from start to finish. "Their goal came against the run of play. I think we were peppering their goal. It was living, I wouldn’t say a charmed life, but we were the ones that were creating most of the chances and then they scored from a counter attack, which sides can do with the way we play, I understand that. “But we showed some great character, once again, to come back, scored at a good time and then a wonderful second. It didn’t change my team talk but made it slightly more positive. Although Alex moved in front when Bowery took advantage of an error from Alan Sheehan to beat James Shea, Jones always knew his side, who have now scored 90 goals this season, were more than capable of mounting a fightback. He added: “We’ve be renowned for starting well, it’s just in recent games, a lot has been made of our starts and conceding after four minutes somtimes, it puts you on the back foot. “But I know we’ve got goals in the side, we’re scoring from everywhere and once again we showed that we had the quality to win a game and we deserved it on the balance of play. “We could have made it a lot more comfortable so that when they did have the late onslaught, by putting (Chris) Porter and Bowery and (Chris) Dagnall and putting everyone up, it could have been a lot more comfortable.